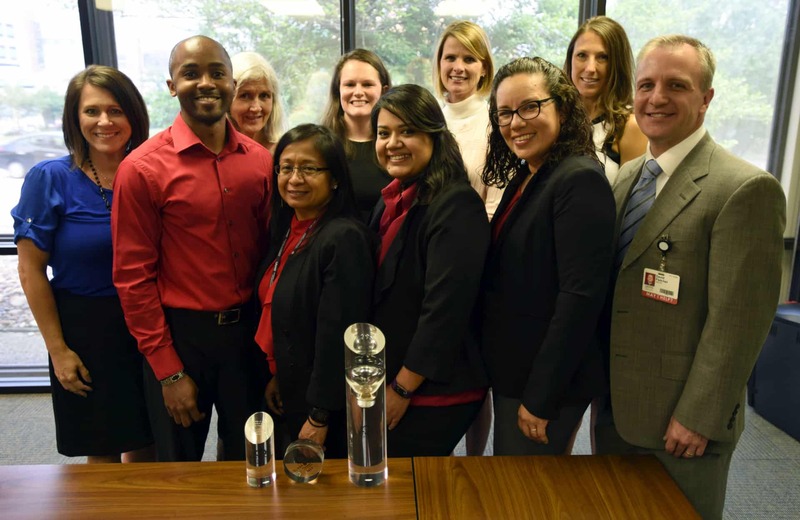 A collaborative team of staff from the Center for Health Literacy and interpreters from the Antenatal and Neonatal Guidelines, Education and Learning System (ANGELS) program at the Center for Distance Health won top honors for their Spanish-language patient handbook. May. 23, 2017 | May 23, 2017 | The University of Arkansas for Medical Sciences (UAMS) Center for Health Literacy won top honors at the ClearMark Awards Ceremony hosted by the Center for Plain Language on May 9 in Washington, D.C.
UAMS won the Grand ClearMark Award in the Spanish language category for its plain language handbook, “Cómo Hablar con su Doctor/How to Talk to Your Doctor.” The booklet was developed by the Center for Health Literacy and the UAMS Antenatal and Neonatal Guidelines, Education and Learning System (ANGELS) interpreters at the Center for Distance Health. The ClearMark Awards recognize clarity and simplicity in documents created by North American companies, governments and organizations. The Center for Plain Language award ceremony also serves as an annual meeting of the minds for some of North America’s greatest plain-language champions. 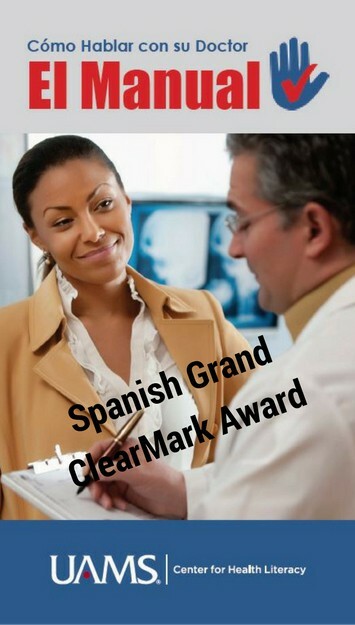 ‘Cómo Hablar con su Doctor/How to Talk to Your Doctor’ won the top award in the Spanish-language category at the ClearMark Awards Ceremony. Kristie Hadden, Ph.D., executive director of the Center for Health Literacy, said the award was the result of great teamwork. The Center for Health Literacy’s mission is to improve society and population health by making health information easy to understand and use. This includes training health care providers to communicate with patients in plain language and improving patients’ understanding of health care topics. For more information, visit healthliteracy.uams.edu. “Cómo Hablar con su Doctor” does both. It was designed to help Spanish-speaking patients prepare to visit their health care provider. The manual uses the patient’s hand as a reminder of the five things to keep in mind for each visit – one per finger. The goal was to overcome known communication barriers related to health literacy for Spanish-speaking patients and to give clinics a tool for helping facilitate communication. Lee Kitchen, program manager and Spanish interpreter with the Center for Distance Health, said the collaborative project aligned perfectly with the center’s core belief that all people have the right to clearly understand their health condition and health care plan. The Center for Health Literacy staff who worked on the project were: Hadden, Tina Moore, Alison Caballero, Katie Leath, Nancy Dockter, Latrina Prince and Andrea Roy. The collaborating Center for Distance Health ANGELS staff were: David Fletcher, Lee Kitchen, Veronica Hernandez, Diana Johnson and Elizabeth Sweat. The Center for Distance Health enables UAMS to keep health care providers both on and off campus trained in the latest health care innovations through continuing education, teleconferences, trainings and other programs. Its ANGELS program aims to improve antenatal and neonatal care, through both online and onsite training; research; and evidence-based guidelines. For more information, visit angels.uams.edu. The Center for Plain Language’s mission is to champion clear communication.